On their Mp3.com web site, Priapistol list the following Similar Artists: Phillip Glass, John Coltrane, Magma, Ruins, Goblin, Frank Zappa, Residents. Quite a spectrum indeed. And on "III", Priapistol seem determined to cover as much ground as possible. The album opens with "JAMROD", a track that is only 1 minute long, but the pounding funky bass zaniness that dominates the music crops up continually throughout the CD. "Fat Man Naked" opens with strange rumbling drones, but soon launches into an interesting cross between early Material styled funk and avant-rock. I enjoyed the contrast between the violin, bass heavy funk, and horror film keyboards (there's the Goblin influence). Proggy keyboards are accompanied by rumbling and grating metallic drones and freaky voicings. Interesting. "Hittin' The Hard Stuff" and "Schwanz 'O' Matic" are both tough on the ears due to the brain piercing noise that makes its presense all too known. "Hittin' The Hard Stuff" has more of the band's funky bass, and percussion that adds a groove to the mix. I'm simultaneously tapping my toes and and screaming in agony! "Mr. Lucky Charms" is an 8 minute glom of keyboard noodlings, piano, and some atmospherics. Most of it is a bit boring, but the last few minutes get quite interesting as the music evolves into a freakout collage that the Residents would be proud of. A well done few minutes of madness. "Straight Up On The Rocks" is a lengthy track that starts with a brief intro kaleidescope of themes repeated from the first few tracks. But the tune quickly develops into a wild jam that makes me think of an acid rock version of the bit that ended "Mr Lucky Charms". Spaced out drones, jazzy percussion, and a generally freaked out space atmosphere make this the strongest track on the disc. Like the Residents and Pink Floyd teaming up for a violently tripped out Revolution #9. As the final track, "Herbie Handcock", begins, I was imagining a raw, somewhat punky, version of King Crimson. It's a bit chaotic, but jams much in the way mid-70's Crimson did. And there's also some cool spacey waves thrown in, and some voice samples that only served to rudely interrupt the groove the band had going. Unfortunately, what started off developing quite nicely hit a wall after about 7 minutes, and the music just kind of dragged for the remainder of the track's 15 minute length. There were good moments that could have been used as tracks of their own, but as a single extended tune it's too inconsistent. In summary, Priapistol have a lot of good ideas and do a good job of incorporating what are clearly a number of varied influences. Still, the raw and chaotic parts often have trouble staying cohesive and can even be downright annoying, though the good moments indicate genuine potential. I'll be interested to hear more. 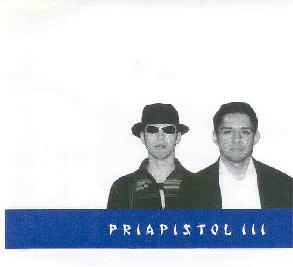 For more information you can visit Priapistol at their web site at: http://www.geocities.com/priapistol/. Hear sound samples at their Mp3.com web site at: http://www.mp3.com/priapistol. Contact via snail mail at 131 E. Woodland; Ferndale, MI 48220.